“We adopted Maddie Mae, and feel very lucky to have her. We had a Pom for 16 years and were sad when she finally passed. We were told Maddie was available by our friend Liz at Bay Breeze. She sent us a text picture and we went to see. Maddie walked right over to us with a “well, let’s go” look. On paper she was a ten year old Pomeranian who was missing an eye and had a noticeable limp. This was so minor compared to her beautiful coat and calm personality. She is 13 now. She walks with us on the beach each morning, and sits on my lap while I craft in the afternoon. 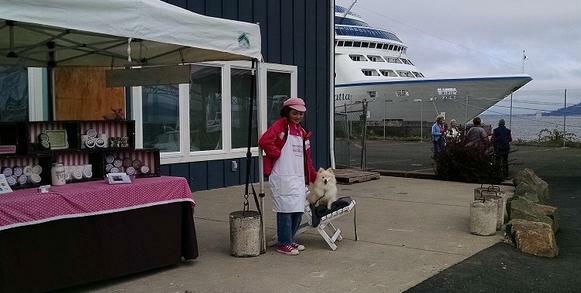 She also holds court at our vendor space at Astoria Sunday Market, and at the Port of Astoria for Cruise Ship markets. This amazing little dog sits nicely in her beach chair and greets sometimes 2000 people as they disembark from the larger ships. Sometimes children will look with concern at her missing eye. We mention that it was just broken and the rest of her is soft and sweet. Once they give her a pet, she has them charmed and they smile.